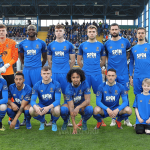 Waterford FC picked up a point on Friday night after a scoreless draw against early league leaders Bohemians. The visitors had picked up the maximum nine points in their opening three games but had to settle for a point against the hardworking Blues. Alan Reynolds made four changes with Cory Galvin, Izzy Akinade, Georgie Poynton and debutant Hugo Keto all coming into the squad. And it was the home side that created the first chance as Bastien Hery found the feet of Cory Galvin but his shot was well saved by Bohemians keeper James Talbot. Bohs midfielder Keith Buckley went close midway through the first half; his left-footed shot dropping narrowly wide of Hugo Keto’s right-hand post, though. Damien Delaney had to be alert to stop Danny Mandroiu breaking before sending the Blues forward. Bastien Hery’s through ball looked to pick out the run of Izzy Akinade but Derek Pender intercepted; he saw his clearance saved by his own goalkeeper. Ali Reghba had a great chance to give Bohs the lead minutes later. The sub was played in by Dinny Corcoran but his shot from the left-side of the area was wide of Keto’s near post. The Blues came back at Bohs and Zack Elbouzedi went close 10 minutes before the break. The winger controlled the ball out on the right, brought the ball onto his left but his powerful effort from 25-yards was just wide of the post. 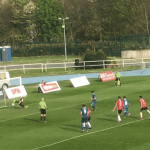 Bohs striker Mandroiu looked set to score six minutes into the second period but the retreating Blues defender Kenny Browne got back to put pressure on the striker as he prepared to shoot and keeper Keto saved. Just past the hour mark, the Blues had a great chance to take the lead. Georgie Poynton’s corner overshot the penalty box and found Kenny Browne at the back post but keeper Talbot did got a hand to the strike and it was cleared off the line. Talbot was called into action again with 20 minutes left when he saved from Rory Feely’s header. Bohs almost grabbed a winner themselves when Rob Cornwall found space inside the penalty area after Waterford failed to clear a corner but the defender’s strike was deflected narrowly wide of Keto’s near post as the game ended scoreless. Bohemians: James Talbot; Derek Pender, Rob Cornwall, James Finnerty, Darragh Leahy, Keith Buckley, Conor Levingston, Luke Wade-Slater (Ali Reghba 27), Danny Mandroiu, Keith Ward (Ryan Swan 77), Dinny Corcoran.